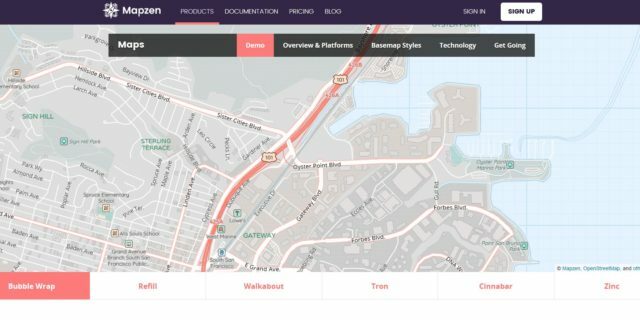 Mapzen is an open and accessible mapping platform aimed to empower users to create unique maps. Focused on the core components of geo platforms, including search, rendering, navigation, and data, Mapzen takes a radical approach to working on these components and build them all entirely in the open. Maps are and for centuries have been incredibly powerful tools for shaping how we see the world and how we live in it. Open-source map technologies follow a long tradition of community-powered cartography. Mapzen provides worldwide coverage of OpenStreetMap base layer data, available in GeoJSON, TopoJSON, and MVT binary format, compatible for display on a number of open technologies, including SVG via D3, OpenLayers, and WebGL. Among the tools offered by Mapzen are a mapping engine, an open-source routing engine, and a geographic search engine. Mapzen’s open and accessible search and routing services can be used anywhere. With or without a map, for business or pleasure, you can put search and navigation in your projects and apps. Take advantage of a growing global address and place coverage dataset with our forward- and reverse-geocoding Search API. Use worldwide OpenStreetMap and GTFS coverage for driving, biking, walking, and transit directions in our Mobility routing API. Whether you are hosting a public or private project, you can use open data that we curate, publish, and create. Download pieces of data for world metropolitan areas from Metro Extracts, or request map data spatially with Vector Tiles. Help make the world of open data better by contributing to some of the community-edited data projects we sponsor and use, like global street coverage in OpenStreetMap, addresses in OpenAddresses, transit schedules in Transitland, or global names and places in the gazetteer Who’s On First.